I wasn't able to run earlier in the week due to weather. But I was able to go out today, even though it did rain a bit. Running a light rain with warm weather is very nice I think. I went out to Kelly Drive. For those not familar with Philadelphia, Kelly Drive is one of the miracles of Philadelphia. Starting at the Art Museum and winding through miles of Fairmount Park, the largest Municipal Park in the States, Kelly drive is wonderful countryside running and biking track in Philadelphia. The planners have added many statues and rest areas throughout the course to make it appeal to families as well as runners. 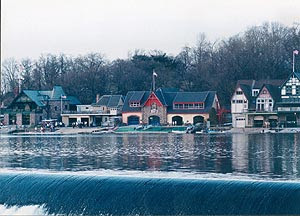 Additionally, the course runs the river where college boat houses abut the water. Most of the boat house are over 100 years old and are pleasantly constructed. The end result is quite remarkable. I am always impressed when I run down there. It is about 15 miles from home so I have to make a commitment before I go, as it takes about 45 minutes to get there through city traffic. However, it is always worth it. Today a high school regata was going on while I was running so I had some distraction on the course. Crew is an interesting sport. I do wish I had looked into when I was in high school. In short today, I ran 4 miles on my recovering ankle (I also walked an additional 2). In short, my ankle did hurt afterward but it was not a pain to worry about, just a dull sore. Which is probably due to underuse. Tomorrow I will run Pennypack park. Turtle Express chugs on.